A convergence of outsourcing and expanding American waistlines is enabling one company and its Maryland franchises to fatten their bottom lines. Americans consumed 4.5 billion pounds of French fries last year along with millions more in crab cakes, chicken wings and mozzarella sticks. Statistics like that mean there’s plenty of work for FiltaFry, which cleans and services deep-frying machines. Put that together with an aversion by restaurant employees, for reasons of aesthetics as well as safety, to cleaning fryers and the company seems to have hit on a recipe for success. The Orlando, Fla.-based company opened its first Maryland franchise in June 2004. Two more have since been added. Its remaining 13 Maryland territories are expected to be sold by the end of next year. FiltaFry is negotiating with at least two parties about starting franchises in Maryland, Sayers said. Current operators include George Clarke, the first franchisee who services restaurants in Montgomery and Prince George’s counties; Scott Brinsfield, who started in August 2004 and covers Ocean City, Salisbury, and most of the Eastern Shore; and Oliver Snyder, who started the Anne Arundel County franchise in May. Maryland clients include Annapolis Seafood, Chick-fil-A, Golden Corral, Houston’s, and the University of Maryland, College Park. Clients with regional and national businesses include Bennigan’s, Dunkin’ Donuts and T.G.I. Friday’s. 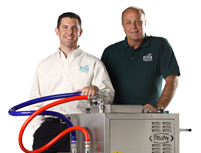 FiltaFry’s business is done by van drivers sporting mobile filtration units. The units purify cooking oil for reuse in addition to cleaning the machines. The technology is impressive, Snyder said. “People are amazed by what a good job it does,” he said. FiltaFry’s service also is cost effective. “One burn from a fryer is likely to cost a restaurant $3,000,” Brinsfield said. “Our average service call is $45. Which would you rather pay?” <>Entrepreneur magazine ranked the company No. 40 on its list of top home-based franchises. Franchisees like FiltaFry because they can set their own hours amid little competition. “There’s no other company that does this,” Snyder said. <>Revenues tripled last year, although the company declined to give specific dollar figures. FiltaFry, part of Filta Group Worldwide Inc., has been minting franchises rapidly, adding an average of eight to 12 a month, according to a company news release. Besides its British birthplace where it has 80 franchises, FiltaFry operates in Australia, Canada, El Salvador, Guatemala, Ireland, Israel, Mexico, Panama, Puerto Rico, Portugal, Spain, South Africa and Turkey. The United States, which FiltaFry entered two years ago, remains the major market. It currently has about 100 franchises in 35 states. The company hopes to have 1,000 eventually.